Fri., Sept. 14, 2018, 5 a.m. First-time bowhunter Anthony Schoen didn’t know how he’d react when, and if, he shot a deer. On Saturday night, Schoen, 28, learned firsthand what it was like when he got his first deer. He didn’t throw up or cry. Schoen spent Saturday night in a blind on a friend’s property near Spokane. Around 7:30, three deer came about 20 yards from where Schoen was hidden. He drew his bow, but only got a partial draw and had to stop. The deer, noticing the slight noise, looked at him but did not run. He drew again, but in his haste he bumped the blind. Two deer ran off. One stayed. Schoen, calming his nerves, ran through his mental checklist, aimed and fired. That was Schoen’s second weekend hunting. 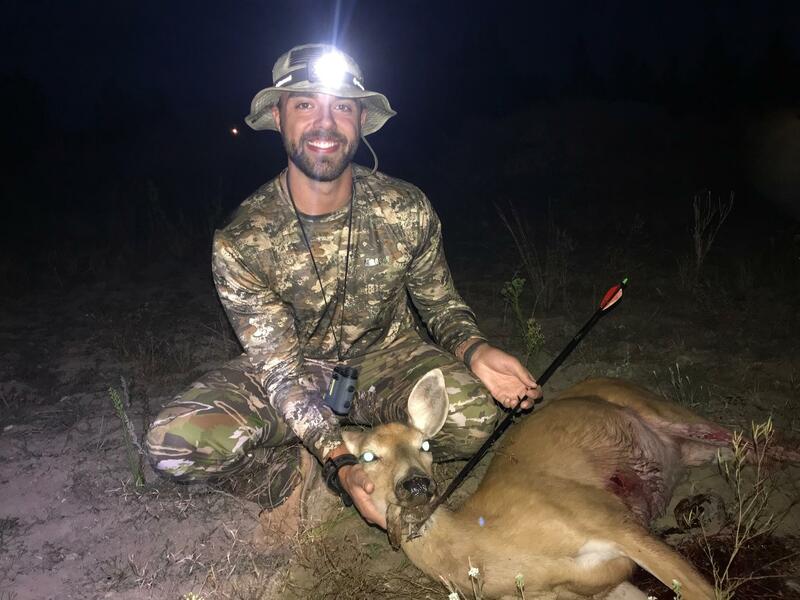 On the opening weekend of archery season in Washington, Schoen and his brother headed out on their own, two newbies looking for some luck. “The first weekend was totally unsuccessful and kind of discouraging,” he said. Schoen and his brother, Garrett Schoen, 25, decided to learn to hunt earlier this year. But Schoen, an engineer in Spokane, plowed through the details. He asked for advice from other hunters he knew. He learned from that first hunting experience, near St. John. Their strategy, at first, was to sneak up on the deer early in the morning where they’d bedded down for the night. That nugget of wisdom came from a friendly hunter they met on their last day near St. John. Although that was a frustrating experience, Schoen said he enjoyed the whole process, success or not. Sitting quietly in nature for hours on end wasn’t something he’d done before. Once he did get a deer, he had some mentorship. Schoen’s friend, Shawn Eller, taught him how to field dress the deer he shot on Saturday night. The next morning, Eller helped him butcher the animal. Schoen got 42 pounds of meat off the animal. On Monday, he cooked some venison steaks for his friends. “I think I overcooked it a bit because I was little nervous,” he said. Schoen decided to bowhunt, rather than rifle hunt, because it’s more primitive and intimate. Now that he got his deer, he’s turning his sights on elk. Published: Sept. 14, 2018, 5 a.m.